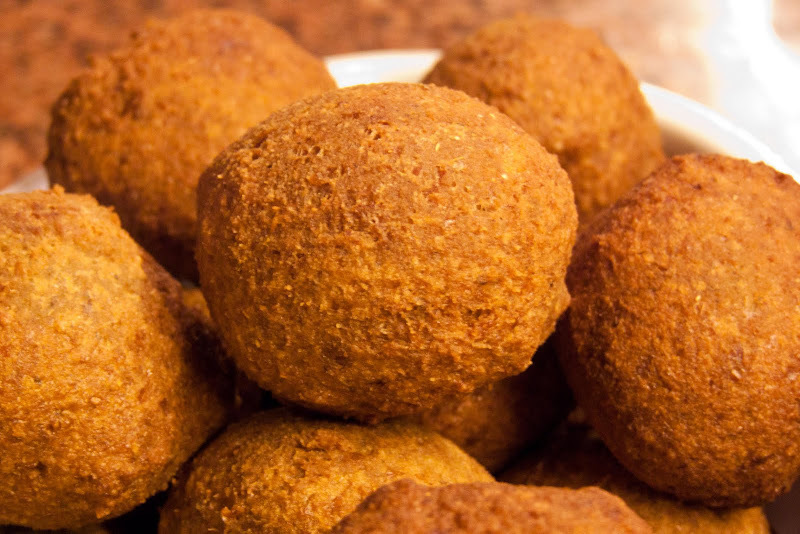 Falafels - small balls made from chickpeas and spice mix - are a popular street food in the Middle East. These golden colour balls are crunchy on the outside, but soft inside and very flavourful. It can be eaten as a snack, served with starters or along with the main course. My favourite, and probably, the most popular way is wrapped in a flat bread (or pitta-like bread pocket) along with fresh or pickled vegetables, different sauces and baba ghanoush or yogurt-garlic dip. 1. Drain the chickpeas and put them into a food processor/blender along with spring onions, parsley, mint, garlic, cumin and coriander powders, green chili peppers and salt. 2. Mix baking powder with 3 tablespoons of warm water and add to the food processor as well. Process until you get a smooth paste. You might need to add just a little bit more of water, but don't add too much as the balls might break when deep-frying. 3. Place the chickpea paste into the fridge for about half an hour. 4. In a deep-frying pan, start heating up enough oil to cover the balls. Take the chickpea paste out of the fridge and form small balls. 5. When the oil is hot and ready, carefully place a few of the balls into the hot oil. Make sure that they don't get stuck to the bottom. You will have to fry them turning once in a while for about 5 minutes, until they brown nicely. The time will depend on the size of the balls, so you might want to check the first one if it is cooked inside. Don't fry it for too long though as they will become dry inside. 6. Remove the balls from the oil and place them on a paper towel.